A healthy and thriving public finance practice, whether dealer or advisor, requires staying on top of clients’ refinancing opportunities. And with roughly half a million fixed-rate, callable, unrefunded securities outstanding from over 50,000 municipal issuers, this can be an expensive and time-consuming challenge. 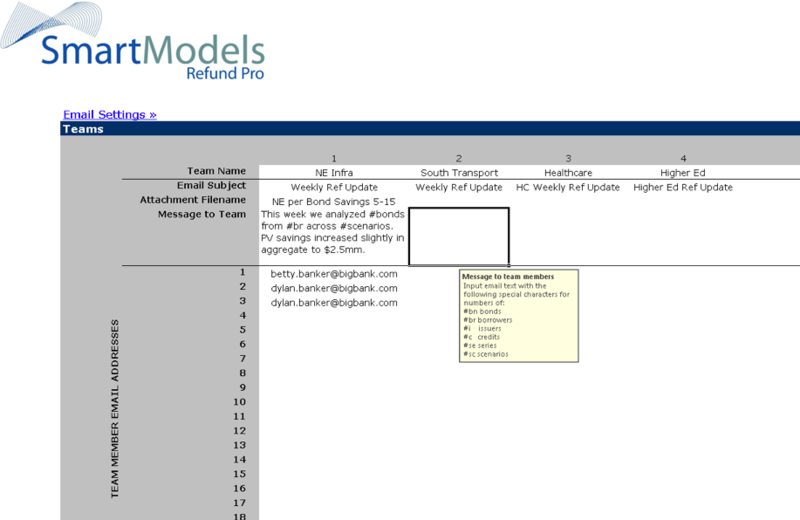 RefundPro with PowerPoint® Integration completely automates the process of tracking refunding numbers from gathering bond terms, correcting outstanding amounts and even advance refundability percentages from your data provider, to running per bond refunding screens, to generating deal-level cash flows. 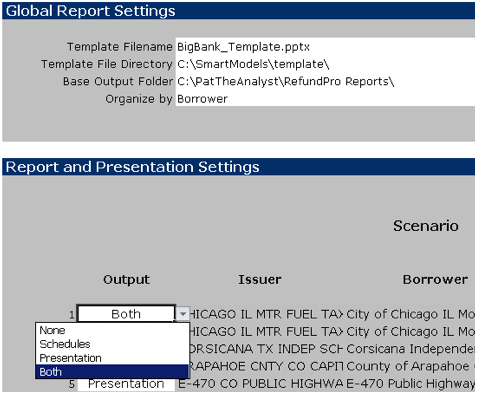 RefundPro emails your selected reports and results to issuer coverage teams while populating a complete directory structure with files of reports, Structure™ models for deal tweaking and—new for 2015b—first draft PowerPoint presentations, using your corporate template, complete with debt service and savings graphs and associated text. Start focusing on high value activities for your clients and targets; RefundPro will handle the rest. Track up to 100 Scenarios per RefundPro file. Scenario organized by Issuer/Borrower/Credit/Tax Status. Auto-generates PowerPoint® Refunding files with customizable graphs and text. User-defined coverage teams receive per-bond and series-level reports directly via email. Extensive screen report customization with over 30 selectable information fields such as Savings as % of Refunded Par, Escrow Cost, Option Value, Negative Arbitrage, etc. Per bond screen savings thresholds lead to series-level sources and uses, savings, and escrow reports. Automatically update outstanding amounts with data service connection. Black-Karasinski option model for traditional callable bond option analysis. Easy-to-learn Excel® interface allows for easy model extensions. Massive time and cost savings relative to standard workflow. Increased accuracy with automated data. Rapid adoption with simple Excel® interface.